Chris was honored as the Sacramento Make-A-Wish Foundation's 2003 Wish Maker of the Year, and has twice received the NBA’s Community Assist Award. 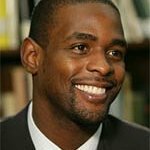 He founded The Chris Webber Foundation in 1993 to help youth and families in need. Webber created “C-Webb’s Crew” in 1999, to provide tickets at every Kings regular home season game to at-risk youth and their families. Chris hosts the Bada Bling! weekends in Las Vegas to benefit the Chris Webber Foundation. Google trends for "Chris Webber"
We don't have any videos related to Chris Webber.